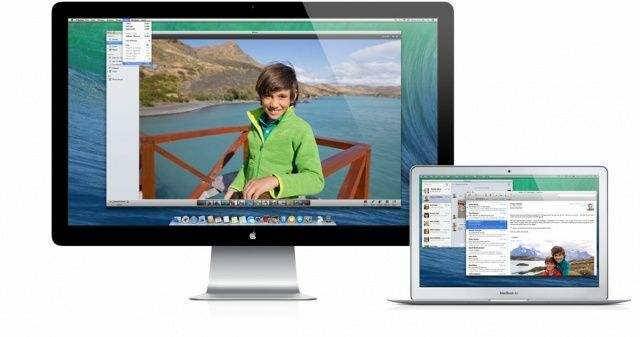 OS X Mavericks (named after a surfing hot spot in California) was announced recently, and it contains a ton of new features for Mac users to pore over and learn anew. While not as incredible an overhaul as the concurrent update to iOS 7, Mavericks still contains some fairly helpful features and additions to make it worth some poking around, even in the beta. Speaking of the beta, remember that any of the stuff we talk about below may only exist in the beta, or in some other form, so enjoy playing around with these things, but don’t worry when things are different when Mavericks releases for real in the Fall. That said, let’s take a look at five new, hidden, and above all, interesting, features of the latest beta for OS X: Mavericks. If you need to use Java for any reason on your Mac, and you install OS X Mavericks beta on it, you’ll be sad when you try and run that Java-reliant bit of software. For me, it was setting up the Minecraft server for my kid after I installed the beta last night to take a look at things. When I went to run it in Terminal, I got an error, saying there was no Java installed. So, even though I’d had Java installed in Mac OS X Mountain Lion, the Mavericks install seems to have taken Java off my Mac. No worries; it was kind of an easy fix. Open up your Terminal app, and type java -version into the window. You’ll see the arrow, and then get a dialogue box that will send you to the Java download web page if you click the More Info… button. Do that, and you’ll get a download page. Scroll down and find the Mac OS X version of Java, and download the dmg file. Once it’s downloaded, double click on the package file after opening the disk image (.dmg), and enter your admin password to install Java. Once the install is complete, check to see if Java is now enabled on your Mac with the same command as above: java -version. If you’ve installed it correctly, you’ll see the version you downloaded. Now you can run your Java stuff without a hitch. My son is pretty happy he can run around our Minecraft server now with his little buddies, building and crafting to his heart’s content. Speech to text is the next new thing, with all devices we use, including our Macs, having the ability to listen to our speech and type what we say for us. What usually makes this magic possible are network-connected processing data centers, that take your speech and convert it to text, all somewhere other than your iPhone device, say. But what if you want to keep what you say to your devices private? 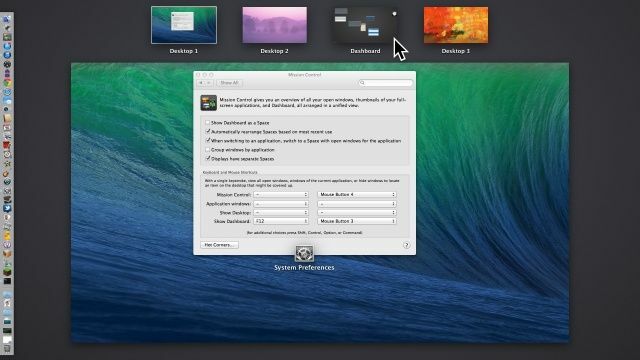 In the new version of OS X, Mavericks beta, there’s a new option to do just that. 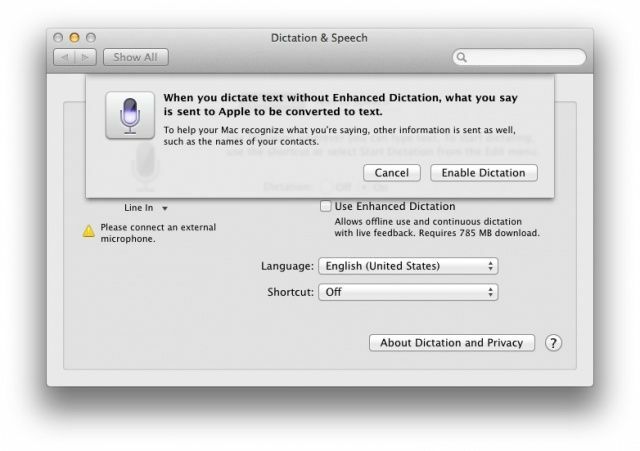 It’s called Enhanced Dictation, and here’s how to enable it. 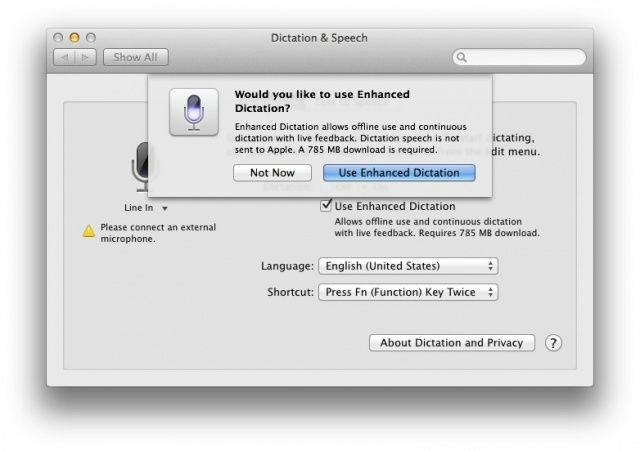 If you have the space on your hard drive, and a decent enough WiFi connection, you can click the Use Enhanced Dictation checkbox and download a 785 MB file that will contain the processing that typically gets sent off to Apple data centers. Now you’re not relying on Apple to keep what you say to your Mac secret. Unfortunately, there’s still no way to do this on iOS, as the devices are smaller, space-wise, and have less processing power than a full sized Mac laptop or desktop computer. When you click on the Notification Center icon in the upper right corner of your Mac’s screen, you’ll see the familiar gray linen background from OS X Mountain Lion. If you’re looking for a toggle switch to Show Alerts and Banners, though, you’ll miss it until you scroll up with your mouse or trackpad. When you scroll up in OS X Mavericks beta, however, you’ll see Do Not Disturb, a feature that’s been on the iPhone since iOS 6. 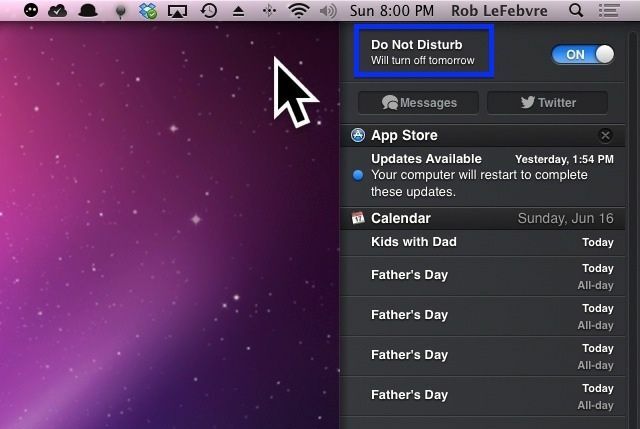 Clicking the Do Not Disturb toggle on your Mac will get rid of any lingering notifications that may have been sitting there, and will keep you from getting notifications on your Mac until the following day, assumedly at midnight. You may also notice that there’s no Facebook button up at the top of the Notification Center, as there is in OS X Mountain Lion. In the Mavericks beta, there’s a button to open your Messages app, instead. Many apps have had access to special characters before, like iChat and Messages. You’d simply click the little smiley face, for example, and get all the fun emoticons Apple has provided. If you wanted to type a special character in a text document, though, you’d have to remember that Option-8 is a text bullet, and Option-K is the degrees symbol, and Option-2 gives you the Trademark symbol. Now, though, in OS X Mavericks beta, you can see visually what special characters are available to you across all applications. Here’s how. When you’re typing in any application that can accept text, simply hit Command-Option-T (or ⌘-⌥-T) to bring up a\n extensive palette of special characters, including emoticons, emoji, and text widgets. Use the button bar along the bottom to choose the special character set you want, or use the clock icon in the far left to access recently used characters. 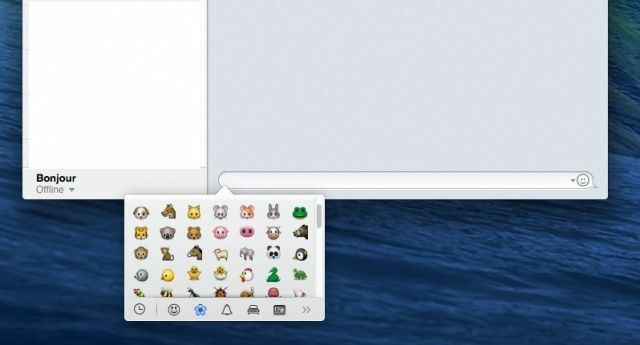 It’s a lot like the emoji keyboard in iOS, only in any app on OS X Mavericks beta. Pro tip: If you click and drag the little pop up special character window, it will tear off from where you were entering text, and become its own window, letting you move it around on the screen. Prior to OS X Mavericks beta, the Dashboard, loaded with useful widgets of all stripe, used to be limited to two states: disabled, or locked to the top left side of the Mission Control screen. First up, you’ll need to activate Mission Control, either with the keyboard key defined in System Preferences, or with the Dock icon. If you see Dashboard to the left of all the other Spaces across the top, it’s enabled. If not, head to System Preferences, click on the Mission Control preferences icon, and click on the Show Dashboard as a Space checkbox. Then you can activate Mission Control. To move Dashboard around, simply click and drag on the little rectangular Dashboard space at the top left, and drag it to the right, letting go of the mouse button when you’ve moved it to where you want it to go. Now the Dashboard space can be anywhere in the rotation you like it. Sweet! To move it back, or disable Dashboard, simply do the same steps in reverse.